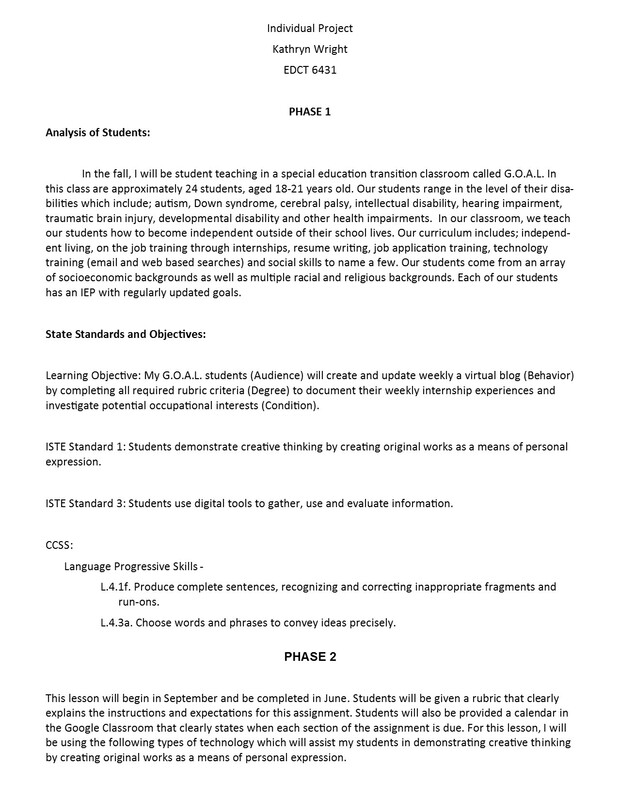 6.1 Assessment – Designing Student Assessments around Criteria and Standards. One year ago, if you would have told me that I would be looking forward to creating new types of assessments each week, I would have thought you were joking. As a paraeducator, I did not understand the importance of determining the student’s level of understanding in order to better select appropriate curricula to meet student’s individual needs. One year later, as a teaching professional, I see assessment in a new light. I rely on the information that assessments provide to help me identify what my students know, identify specific needs, select appropriate curricula and set goals. Without the carefully collected ongoing assessment information, teachers make the assumption that all learners are the same. I have found that in special education, students do not progress at the same rate and in the same patterns. I’ve learned that it is necessary to use collected data to make adjustments during the instructional sequence for students to better understand new material. A key part in applying assessment data to learning is the ability to strengthen the link between differentiated instruction and assessment. Some students will move at a quicker pace or with greater independence; others will move with more foundational tasks or tasks structured with greater support mechanisms (Moon, 231). I teach in an 18-21 year old transition classroom where the main academic focus is on vocational abilities and technical reading and writing. My students spend half of their school day at job site internships. At the beginning of this year, I was having a difficult time assessing their progress, on our core vocational skills, at their jobsites. I would receive feedback from our paraeducators who accompany them to their internship site each day but it was apparent, after interviewing my students, that there was a lack of understanding between the internship goals and the students comprehending the expectation. With that in mind, I created an Intern Assessment and an Independence. Previous versions of the Intern Assessment had been used in the past but I felt that it would be highly beneficial to add a section for the student to assess themselves. Figure 1 shows our Intern Assessment. This assessment is filled out each work day by both the student (Intern) and the paraedcucator (job coach). Figure 2 shows our Independence Assessment. 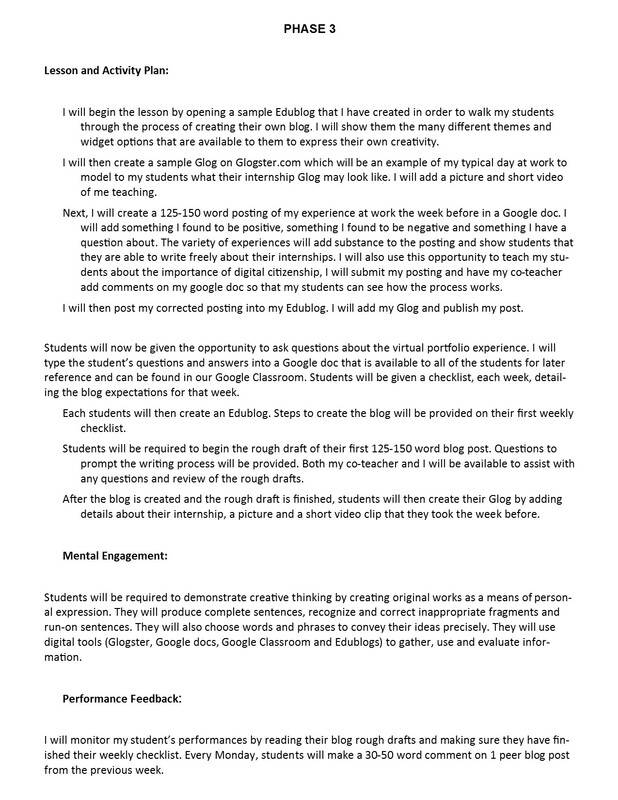 Like our Intern Assessment, this assessment was created for our students and paraeducators to fill out. This assessment is filled out on Friday of each week. Throughout my internship process, I myself have had to participate in a variety of self-assessments. I have found this to be beneficial to my learning as an educator as it has helped me to take a deeper look at my own abilities based on the discrepancies between my current and desired performance. 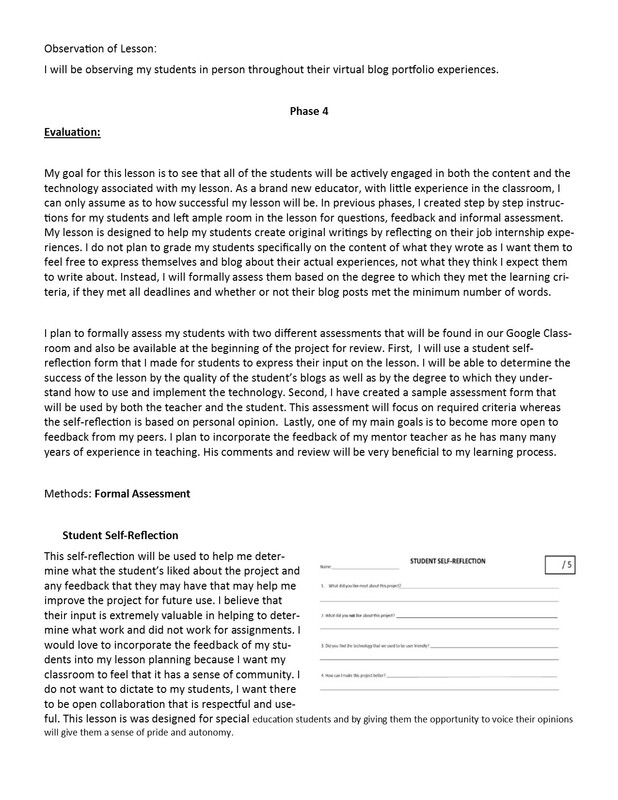 I incorporated self-assessment into my student’s daily and weekly assessments because I wanted them to fully conceptualize their benchmarks for performance and criteria for evaluation. Students are able to construct meaning, in part, by self assessing prior to and during learning. They organize, evaluate and internalize when learning and self-assessment is part of that process. They must connect new knowledge, understanding and skills with what they have already stored and used. It fosters their ability to make these connections themselves, provides a mechanism to enhance learning in a meaningful way and results in greater student motivation and confidence (McMillan & Hearn, 2008). I am now in month 7 of my internship and I have seen a substantial growth in my students abilities while at their work site. 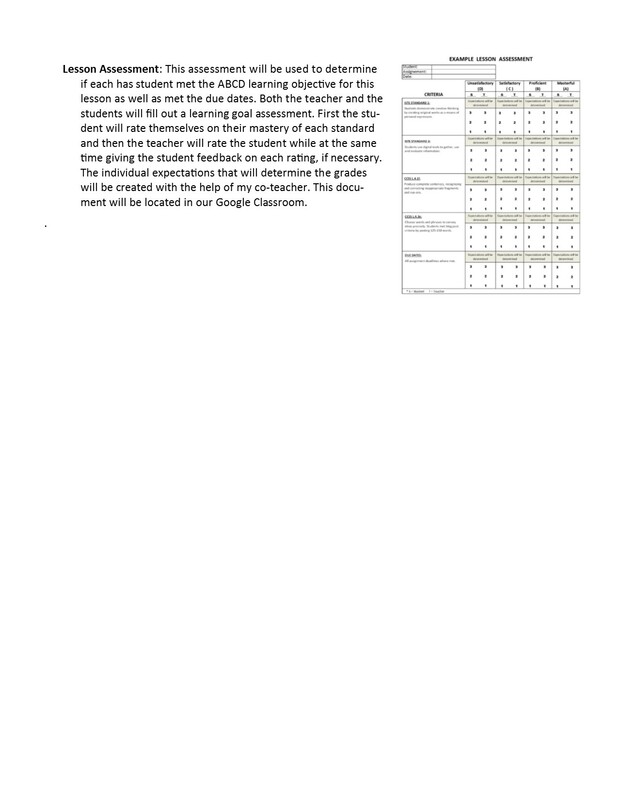 The intern and independence assessments were always beneficial in visually allowing my students the degree to which they were improving based on the paraeducators assessments. I believe that by adding in the opportunity for self-assessment, my students have improved their understanding of the expectations, reflected on their own learning, generated strategies for more learning and improved their performance with meaningful motivation. Next year, I may be working in a classroom that is not transition. I am looking forward to the opportunity to adapt these assessments to be implemented in a variety of education settings. I believe that it is important to encourage self-assessment in all grade levels as it promotes self-efficacy and confidence to learning. I know that I have grown considerable as an educator over the past 7 months and truly have found a passion for the use of assessments. Tracking student progress is not only for collecting and analyzing information but it also is used to reflect on the learning process. Moon, T. (2005). The role of assessment and differentiation. Theory into Practice, 44(3), 226-233. This entry was posted in 6. Assessment, EDU 6136, Internship and tagged effective teacher, Internship, Self-Assessment on March 20, 2016 by Kathryn Wright bPortfolio.